Home » E-cigarette Blog » Does vaping set off smoke-detectors in a hotel room? Vaping has certainly taken the world by storm. Many people have opted to stop using their smellier, smaller, and more expensive cigarettes in exchange for a vaporizer. In many ways, this is great, but some people have questions left to be answered. Many of the most important vaping questions revolve around the fact that a vape doesn’t actually produce smoke. This means that, until laws have been clearly defined, people are unsure as to whether or not they can use their vapes in areas like hotels – especially in areas with smoke alarms. In this article we’re going to discuss whether or not vapes can set off a smoke detector so you can know if you’re safe or not. 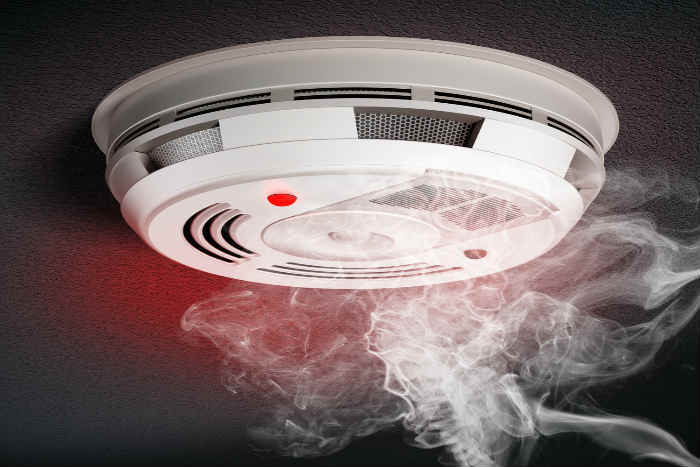 In most cases, a vape won’t set off a smoke alarm because they’re designed to detect smoke, not vapor. But that’s not always the case. The answer depends on the type of smoke alarm available. These are the three most common forms of smoke detectors that you’ll find nowadays. Heat alarms are the least of your worries. These smoke alarms are made to detect the heat in an area and won’t go off if they detect smoke or vapor. These are used often in kitchens and areas where extremely high heat could indicate an issue. These smoke alarms work because of radioactive material. This radioactive material passes through a small chamber, known as an ionization chamber, with electrodes situated at either end of the chamber. The detectors are built so that there is a constant flow of air between the two electrodes. Normally, this is fine, but if smoke enters the chamber then it reduces the ionization and thus causes a hiccup in the flow between the two electrodes which results in the alarm being set off. It’s certainly possible for an ionization detector to be set off from a vape, but it’s nowhere near as likely as it would be with smoke. Vapor is very light whereas smoke is dense with particles which are more likely to interrupt the flow of electricity. These sorts of detectors are the most likely to be triggered by vapor. That’s because these detectors make use of light beams to detect smoke around them. Unfortunately, it’s not just smoke that can interfere with a light beam. Things like dust and vapor will trigger the same response, so if you blow a huge cloud directly at the detector, chances are that it will go off. Again, this is less likely to happen with smoke than it is with vapor – but it could still happen. The most important thing is to be cautious and to vape smaller clouds if possible. The best thing to do to stay safe is to simply be aware. If you’re in an area with a smoke detector, blow your vape cloud as far away as possible. Vape infrequently and open windows if possible. If there are multiple people, try to ensure that everyone doesn’t vape at the same time.